GINGER BERGLUND AND SCOTT WHITFIELD are an absolutely top-notch jazz vocal duo. Practicing the extreme sport of big band, they have been dubbed "the swingmeister" and "fabulous chanteuse." Think Mel Torme/Jack Jones meets Julie London/Annie Ross. Or Rosemary Clooney and Bing Crosby. What sets them apart? Talent and experience in spades. Shakespeare said that "All things by season seasoned are...to their right praise and true perfection." They've worked musical lifetimes to find each other and are the real seasoned and swingin' deal! Their silky vocal blend, innate sense of swing, and reverence for the jazz tradition, evokes memories of Jackie Cain and Roy Kral. The Great American Songbook serves as a centerpiece of their repertoire, includes some of the great jazz classics, and a sprinkling of original material. With a dash of international languages and flavoring, they are a unique songwriting team of musical gravitas. 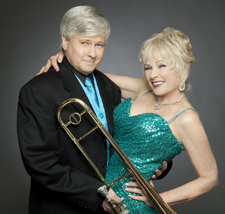 Ginger & Scott also tour with The Stan Kenton Alumni Band & Scott appears with The Johnny Mandel Big Band playing trombone.